Rakesh Munoruth has been working since more than two decades at the 5-star Maritim Resort & Spa Mauritius to reach the rank of Chef of the gourmet restaurant Château Mon Désir. 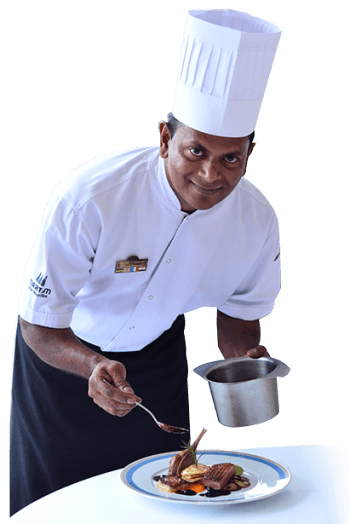 With more than twenty years at Maritim Resort & Spa Mauritius, this enthusiast has gained, throughout the years, an extensive experience starting from Kitchen Steward to Commis Chef, Chef de Partie, Sous Chef and then Chef. His passion, motivation and will to learn have allowed him to reach this level and to become the Chef of the Château Mon Désir fine dining restaurant which is one of the best culinary addresses of the island. He had the chance to follow many training at the hotel and in Germany in various hotels of the Maritim Hotels group under the guidance of prestigious Chefs as well as in Mauritius with 3-Star Michelin Chef Harald Wohlfahrt, 1-Star Michelin Chef Lutz Niemann, the French Chefs Frank Mischler and Christian Rougier, both ‘Maître Cuisinier de France’ and the Italian Michelin star Chefs Marcello Trentini and Paolo Cappuccio.